If you’re looking for a way to get a break from classes, spend some time outdoors and make some new friends, University of Wisconsin–Stout’s Alfresco Outing Club is your group. 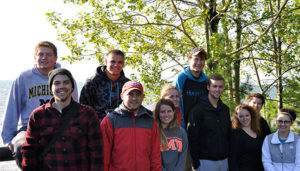 The Alfresco Outing Club is an outdoors-oriented group that coordinates a variety of outings such as camping, hiking, backpacking and canoeing. The club is open to anyone who is interested, with a membership fee of $25 each semester and a variety of outings to fit a wide range of interests. The group plans to go on at least one weekend outing each month, as well as a few day trips. They have also taken spring break trips in the past. 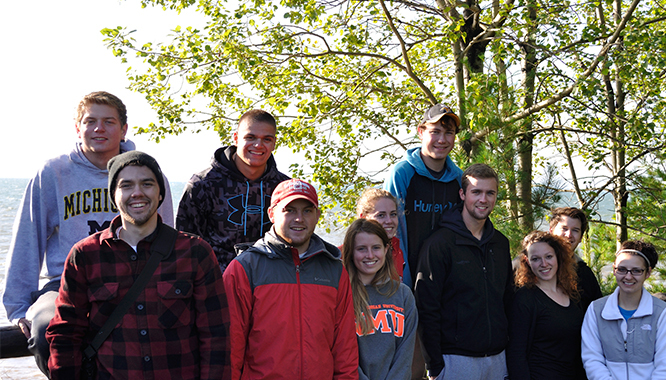 The group has already taken their first trip of the year to Madeline Island in Bayfield, Wis. Their next event will be a camping trip in Hayward, Wis. on Oct. 17 to 19. Anyone interested should reserve a spot one to two weeks in advance with a small reservation fee. The group is very flexible and open to input from its members whether it be about details such as meals and carpooling or suggestions for future outings. Numbers for each event range from 10 to 25 people. The group has members with a variety of ages and majors, but they all have one thing in common: they like to be outdoors. “It really just feels like a group of friends planning and going on a camping trip,” said Datt. Even in less than desirable circumstances, the trips are always enjoyable. Datt recalled a trip last year to the Porcupine Mountains in the Upper Peninsula, where they had a two-mile hike into the campsite without knowing beforehand that there would be deep snow to trudge through.